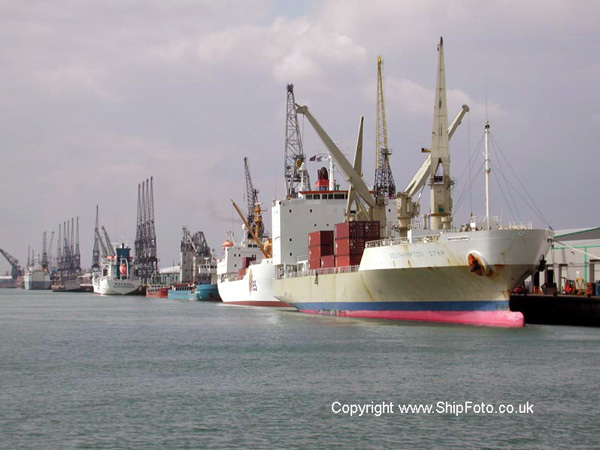 My nearest port, the Port of Southampton is of course famous as a Cruise Terminal, but also is one of the UK's major container, roll-on roll-off, bulk cargo and oil terminals. 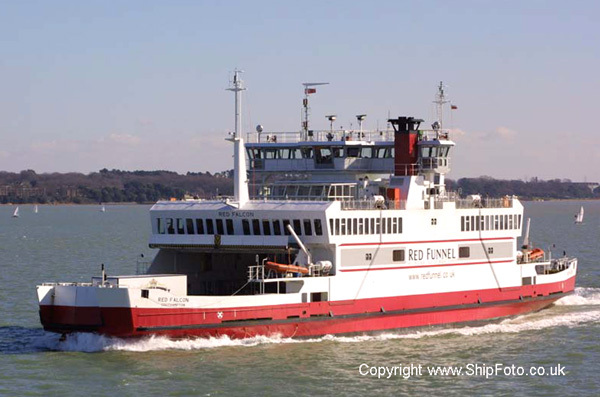 Town Quay - The departure point of the Red Jet Hi-Speed services to the Isle of Wight. All container shipping and all the vessels for the Western Docks in Southampton pass close to Town Quay. However, after midday, the sunlight is generally against you for photography. For the last few years the end of Town Quay has been cordoned off due to it being allegedly unsafe. This makes bow shots of ships entering the port quite difficult. Mayflower Park - A similar vantage point to Town Quay, but you also get a close-up view of the shipping at the cruise terminal at berth 101 which is adjacent to the park and other shipping more distant at the remainder of the berths in the Western Docks. Mayflower Park is, however closed for the duration of the Southampton boatshow in the summer and for some time before and after the boatshow, temporary pontoons and pilings make photography difficult. Hythe Pier - You can get good photographs of all the shipping arriving and departing from Southampton, but you will need a telephoto lens. The sunlight is on the correct side here for photographs for most of the day after 10am. Hythe Pier is the departure point for the Hythe-Southampton ferry, from which you can get good close up views of any cruise ships at the QE II and Ocean terminals and also cargo ships in the Eastern Docks. Red Funnel Vehicle Ferries - If you take a trip on the Red Funnel Vehicle Ferries, departing from Royal Pier, for East Cowes on the Isle of Wight, you can get good close up views of any shipping in the Eastern Docks, including the QE II terminal, the tanker traffic at Exxon's Fawley refinery (5 berths) and BP's Hamble oil jetty (1 berth). Tanker traffic generally consists of tankers up to 150,000dwt, but occasionally there is a VLCC present on the Exxon terminal. As well as the berthed shipping it is usual to see a few ships on the move in Southampton Water which makes for good close up shots as the channel which the ferries and commercial shipping share is fairly narrow. Harbour Tours - Blue Funnel Cruises offer boat trips around the harbour in the summer months and sometimes when there are cruise ships in harbour. One of the first areas I visited on the continent to take ship photographs. It is possible to take excellent shots of ships underway on the Nieuwe Waterweg which is the route that ships take to travel to the old docks at Rotterdam. Since the arrival of the new container, oil and bulk terminals at Europoort, the traffic volume on the Nieuwe Waterweg has reduced in the last few years. However you can still photograph approximately 40 ships underway a day. Hook of Holland - At the mouth of the Nieuwe Waterweg is the Stena Line ferry terminal, walk past the terminal, seaward, around the small harbour used by the pilot boats and you get to the banks of the Nieuwe Waterweg. From this location you can take good photographs in the morning up to about midday when the sun starts to interfere with the photography. Ships coming from and going to Rotterdam's old port complex pass very close to this area. Also, you can see the shipping at the Europoort complex in the distance from here. The town of the Hook of Holland is just a few minutes walk away as is the railway station for trains towards Rotterdam. These days the view has somewhat been spoilt by a number of wind turbines which have been built at Maasvlakte and on the Southern bank of the Nieuwe Waterweg. Hook of Holland to Europoort Fast Ferry - a fast ferry now operates from pilot station harbour at the Hook of Holland to Europoort and also to Rozenburg. Unlike most fast ferries this one has a open deckspace at the stern allowing photographs to be taken. Maasvlakte - a photographic vantage point for vessels entering or leaving from Europoort exists on the Southern side of the entrance to Europoort. You will need a car to reach this area as it is a bit off the beaten track. The sun is good for taking photographs from here in the afternoon. Rozenburg - Situated on the banks of the Nieuwe Waterweg between the Hook of Holland and Rotterdam is the quiet town of Rozenburg. There is a ferry crossing the Nieuwe Waterweg from Maasluiss (where there is a railway station on the line to the Hook of Holland) to Rozenburg. At the ferry terminal on the Rozenburg side of the river there is an area where you can get excellent shots of incoming ships underway at close quarters after midday when the sun will then be behind you. You can also get good photographs of outgoing ships as well, but the background for outgoing ships is cluttered by the town of Maasluiss. If you walk about 1km towards Rotterdam from the Rozenburg ferry terminal you get to the optimum location for photographs, ships pass very close at this point in both directions and the background is uncluttered. "The Hill" - "The Hill" is at the end of the spit of land which separates the Caland Canal from the Nieuwe Waterweg. You will need a car to get here. The hill offers a vantage point for viewing shipping in Europoort and the Caland Canal. The roundabout at the base of the hill offers good views of shipping entering or leaving the Nieuwe Waterweg as well. Rotterdam - You can also take a short docks tour on the Spido boats from Rotterdam - whose departure point is near the unmistakable Erasmus Bridge. My favourite place - the River Schelde! Antwerp is, as far as I am concerned, the best port in Europe for variety of shipping, especially the older conventional cargo ships - a dying breed in these days of containerisation. Antwerp is several miles upstream on the River Schelde. There are several excellent locations which allow you to photograph ships underway on the river. Vlissingen - A busy town situated at the mouth of the River Schelde, on the Northern bank. Vlissingen has a small enclosed port which does not see a lot of traffic these days. It is also the departure point of the ferry to Breskens on the Southern bank of the River Schelde. The conventional passenger and vehicle ferries have been replaced by high speed passenger only ferries due to the opening of the new Westerschelde road tunnel. Ships inbound to the Schelde ports pick up their pilots for the River Schelde at a point off Vlissingen. One of the two shipping lanes into the River Schelde passes close to the beach at Vlissingen, however, the larger ships bound for the Schelde normally use the other shipping channel which is over the other side of the river from Vlissingen. Good photographs can be taken of the shipping in the closest shipping channel from the beach at Vlissingen, particularly in the early morning when the sun is behind you. 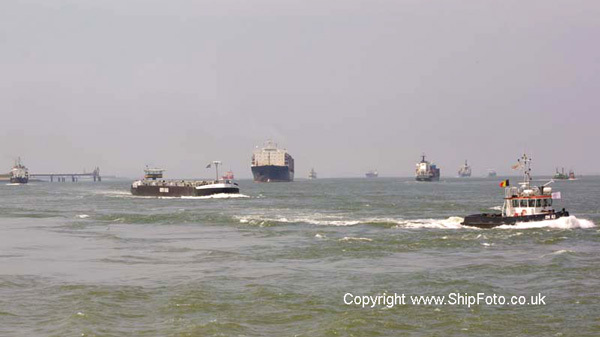 However, the best photographs can be taken from the various breakwaters near to the Pilot Station and railway station. As Vlissingen is on the Northern bank of the River Schelde, the sun can interfere with photography, particularly around the middle of the day. You will need a telephoto lens to photograph the larger ships which tend to use the furthest channel from Vlissingen. The sun is best from late afternoon onwards. Terneuzen - In my view the best place for ship photography in the River Schelde. This pretty town is situated on the banks of the River Schelde overlooking the shipping lanes. It is also situated at the junction where the Gent-Terneuzen canal joins the River Schelde. There are a number of locations to take photographs from. If you like taking photographs of ships underway, at speed, with no distracting background, then this is the place for you. The best place, where the ships inward bound to Antwerp pass very close to is the breakwater on the Western side of Terneuzen's old harbour (these days mainly a marina and tug harbour.). Walk out to the end of the breakwater for photographs of ships close quarters, wonderful in Summertime, but can be very cold in Winter! An alternative location is on the bank where ships enter the main locks at Terneuzen, to the west of the locks is a small car park on the bank. This position is good in the afternoon when the sun is behind you. From this position you can photograph all the traffic into and out of the Gent canal at close quarters as well as the shipping in the River Schelde bound for Antwerp (but it's not as close here as the location above). The Gent canal sees quite a few movements daily, with regular movements of large bulk carriers, coastal shipping, roll-on roll-off ships and tankers. A busy day at Terneuzen! Walsoorden - a small village situated on the banks of the River Schelde, with a very small harbour. Vessels travelling to and from Antwerp pass very close to Walsoorden. The sun is especially good here in the late afternoon and evening. You will need a car to get here as there are no public transport links to Walsoorden. There are two locations, one at the entrance to the harbour where you can drive your car to the water's edge. The other is a breakwater to the seaward side of Walsoorden, which ships pass close to. However, do not use this location at high water as the wash from passing ships can easily wash over the top of this breakwater!! !